2018 has been the year of learning to love tofu. Before going plant-based, the thought of voluntarily eating a tofu prominent dish was not that appealing. When I started cutting animal products out of my diet, I realized I needed to give it a second chance in order to broaden my diet, and I’m glad I did! 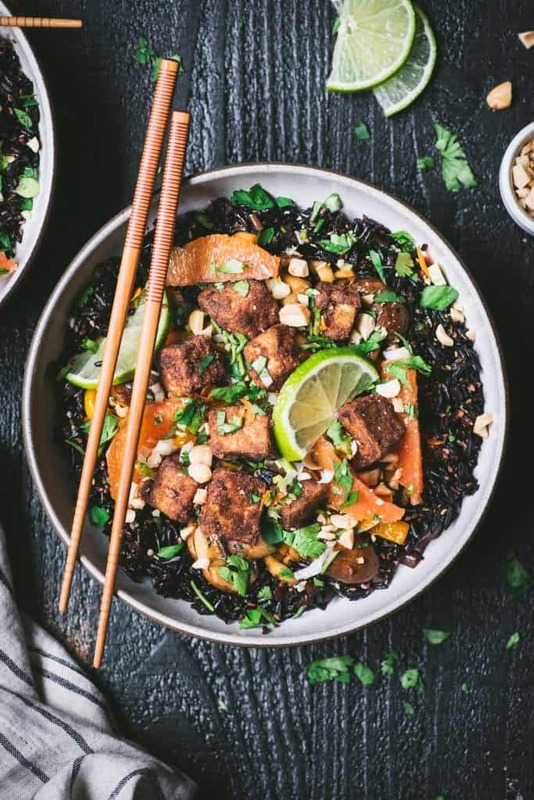 Otherwise, we probably wouldn’t have discovered the joys of crispy baked tofu, which shines in this Sesame Orange Black Rice with Five Spice Baked Tofu. Tofu is incredibly versatile and really takes on the flavor of any dish. When it comes to texture, I’m still a bit iffy on the soft/silken variety, but extra firm tofu crisps us beautifully when pan-fried or baked. In this dish, we chose to bake the tofu because we didn’t want to deal with the mess of frying, but it would definitely be delicious fried in a neutral, high heat oil! 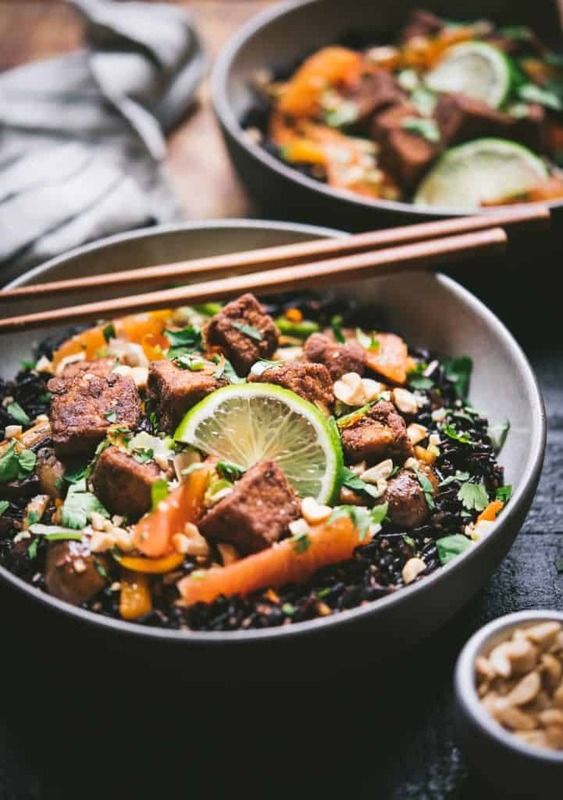 Black rice is a rich source of antioxidants and makes for a nice change from brown or white rice, but if you don’t have any on hand, simply substitute with your favorite brown or white rice. 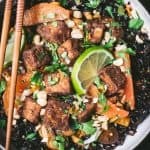 Fresh oranges add a nice pop of sweetness and acidity to counterbalance strong, fragrant five spice blend, and sesame adds depth of flavor. 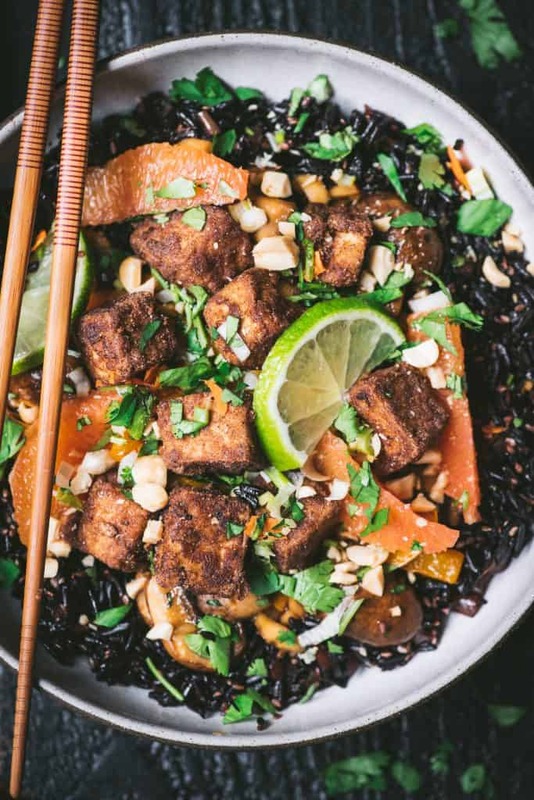 Flavorful stir fried veggies + five spice tofu + nutty black rice = the vegan weeknight dinner you needed! In a small bowl, whisk remaining ingredients together. Pour over cooked rice and stir to combine. Set aside. Heat large pan to medium high. Add a bit of oil, then add mushrooms and peppers and sauté, stirring occasionally. Meanwhile, whisk together sesame oil, tamari, orange juice, rice wine vinegar, sambal oelek, garlic, sugar, ginger and arrowroot. Pour into sauté pan and continue cooking until vegetables are tender and sauce is slightly reduced and thickened. Add in green onion, cilantro and chopped peanuts. Stir and remove from heat. Whisk together remaining ingredients and pour over tofu. Toss to coat and bake 20-25 minutes. Assemble bowls as desired and top with fresh orange segments, chopped peanuts and cilantro.